Zerene Stacker is a "focus stacking" program designed specifically for challenging macro subjects and discerning photographers. Of course it works great with simpler subjects, close-ups, and landscapes also! 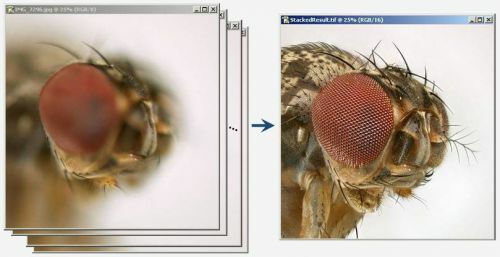 This subject is a common fruit fly, as seen through a 100X microscope. Individual image on the left, stacked result on the right.